The AS/400 - also called the "IBM iSeries," is a midrange server from IBM, designed for the business world. TN5250 is a terminal emulator which provides access to an AS/400. Wants to receive print jobs from an AS/400, try Mocha TN3812 for iPhone/iPad. Before buying please try TN5250 Lite FEATURES: - Supports all standard 5250 emulation features. - Alternate screen size (24x80 or 27x132). - SSL/TLS (Secure Socket Layer). - Zoom and scroll as the Safari browser - Auto login. - Voice input. - Hardware barcode scanners from SocketMobile and Linea. - Support for Zebra LI3678 barcode scanner. - Camera as barcode scanner. - Clipboard. - Support for 10 different EBCDIC code pages. - Colors can be customized. - Device name support. - Hotspots. This app is well worth the Money!!! Can't use it for anything... Is there a way to get a refund? Works the iSeries like a Pro! This app works just as described. From the 24 function keys to macros, everything is there, page up & down you name it. This is the best App for AS/400! The support is horrible. If you loose your server it can be 20 min before you can log in again. The rest emulates the terminal well. If you need 5250, this is the app to have ! Straight-forward app without any issues. This is a great App! I use it everyday to log in remotely wherever I am to work! Can't imagine being without it ! This app works very well. You pretty much have to pay the $30 bucks for the full version. The lite version has very limited keyboard use and will drive you nuts with keyboard switching. Even with the full version, using the onscreen keyboard will drive you nuts in landscape mode. Use portrait and you get all the keys on the screen at the same time, then if you want to see 132 characters in a report, turn it to landscape. For fun, I tried a Logitech MX 5000 Bluetooth keyboard with it, and that makes the app almost as good as a regular pc access to the AS400, except I could not get the function keys on the physical keyboard to work. So I used the onscreen fx key board and the fx hotspots in landscape mode along with the physical keyboard, and that is workable. For the most part, use this app in the portrait mode with the onscreen keyboard when you need something to carry around the office. In your own office, use your pc terminal. Ideas for improvement. Let the user define keys as you can via a pc connection on Client Access, or give the user more buttons on the screen that can be defined by the user. Overall, an excellent app. Just got it, so far pretty awesome! Only reason I didn't give it a 5 star is because I'm learning how to navigate the program! Connect with the standard VPN, launch TN5250, & you are set! No more scrambling for or having to carry my laptop all the time, running to the office when there's an issue, I can do everything directly from your iPad!! Couldn't live without it! I am down grading my rating to 1 star. After swapping 8-10 emails with tech support, I still have no answers. The question is simple, will this work over cellular as well as WIFI. The WIFI side of this is flawless. Cellular, not so much. I can not get it to connect. I can also not get a straight answer. If this is supposed to work over cellular, tech support should be able to help me set it up. WIFI was a breeze..... If help improves and straight answers are provided I will be happy to Raise my rating. Full keyboard on landscape mode? Can you show full keyboard (with function and numeric keys) on landscape mode? It only shows on portrait. If you know what this app is for, then you already know you need it. Perfect, simple 5250 emulation with SSL support. 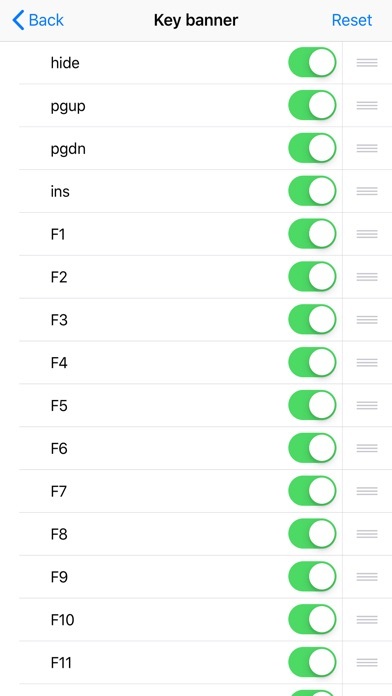 Great for iSeries app admins. This app would be great if it kept the session alive when u navigate away from the app to check email. Once that's fixed, it's an easy 5 star. This tool is sorely lacking when compared to pretty much any pc-based (or even Mac-based) 5250 client. It needs multiple session support. It needs better keyboard options. Most of all, it needs multi tasking support. It drives me nuts to have this app dump me out of my session when I swipe over to Mail or Safari. It's better than nothing, but IMO it isn't worth $30. This is a must have for System i admins. Has saved me many times on the road or out on the town to answer fix a problem on the go. No need to pull out a laptop and find wifi. On AT&T you can talk to a user while shopping for groceries and type at the same on 3G:) .. (of course that is painful on a 3.5" screen... But beats going home) It doesn't have VPN options, so for 3G use you need a connection facing the Internet. (security gurus don't like that) It is Very nice on iPad with the BT keyboard... I have a coworker that uses it a lot. The app is good. The disappointing thing is that none of the function and arrow buttons work with any Bluetooth keyboards. AWESOME app! It sits prominently on my dock, as I use it every day. .... it was broken by the dec 12th update. I reverted to the previous version (thank you time machine). TN5250 has been reliable but the recent update has not allowed me to connect anymore. The connection responds with 'AS/400 has ended connection.' This not due to any system changes disallowing SSL connections because normal PC connection via Client Access via SSL still is allowed. Please update the product quickly to allow connectivity again. Several co-workers are experiencing the same issues after updating the App. I was so hesitant to spend $30 on this app, price point is kind of high I Feel. Paid version does everything I need except pasting from the clipboard. Other than not being able to paste from clipboard, the app is fully functional and I am going to recommend the app for my co-workers. Volume licenses would be great, if they can do that with apps. I purchased this application already having seen it in action on a few mobile phones. The iPad version is naturally a much better experience with the additional real estate afforded it on the iPad display. However I don't think much effort was put into utilizing the iPad to it's fullest potential. The limited wireless keyboard support is overstated as the lack of fn keys and other 5250 highly used keys make nit useless to me and reminds me of the lite version of the app. I also had a devil of a time keeping the keyboard connection alive while on VPN. Bluetooth keyboard performs flawlessly in all other apps. The other knock I would express is no fully functional keyboard in landscape mode. I am constantly switching between the qwerty, fn, navigational, and numpad keyboards. All of these keyboards can be made active in portrait mode but session display is too small to be used on long term basis. You can zoom the session while in portrait which is somewhat of a help but I would much prefer qwerty, fn, and navigational keys all be available in landscape mode. All in all though the app is useful, stable, and makes mobile support so much nicer than toting around my brick of a laptop, Oh and one more thing....no multitask support. Session drops when exiting app. This function wasn't available when app was released so hoping for an update that does. Still a four star app if only because at least someone remembered us dinosaurs on the iSeries. The platform with uptime stats that cannot be surpassed IMHO. Just needs the ability to connect 5250 session as a remote console. Much more usable from the iPad, but what stops this from being a killer app is support for F-keys on a wireless keyboard. If this gets updated it will get 5 stars and make my things much more convenient for me. With the latest update, which has added a single, complete on-screen keyboard as well as support for a wireless keyboard, this app now has everything I need to do my job from anywhere. Check it out! This app works great, especially since they've added the additional keyboard layout on iPad. Every key you need on a single screen ! This would be a great if it just supported using an the keyboard/doc. You have to flip among the onscreen keyboards so much that it's VERY slow going, so if it supports at least the alpha and numbers characters on the keyboard, it would make my remote support so much easier. As it it's just good for very light usage. Really enjoy this app and it does everything I need. I do wish this app had better keyboards for iPad. I wish the keyboards would act similar to the ones in Numbers or another app called Jump. This app works great with the Ipad. However, it does not support the use of a bluetooth keyboard which makes it much harder to use. If it had that support it would be five stars. This is an unbelievably good app. 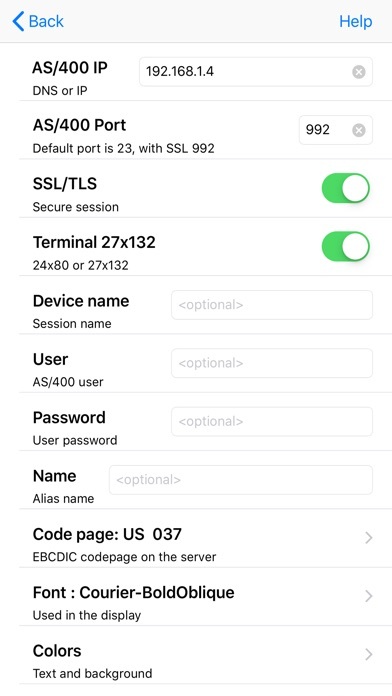 I use it to connect to multiple AS/400s using the VPN tool included with the iPhone. My laptop is seldom used when traveling. Worked great first try. I was able to remotely fix user issues and run backups from my handset. I am a 20 year user of as400 system and I love this app! I no longer have to carry my laptop into meetings "just in case" I need to look up information from the as400 system at the office. The 30$ is worth it's weight, literally. I gave it four stars because I do not like that it returns to login screen before I sign off. Still very satisfied with it overall. I hesitated on iPhone 2.0 until I saw this app. Very happy now! I'm no computer guru, but my employer has a lot of "back office" systems (Accounting, HR systems, etc.) on the iSeries and from the little bit of messing around I've done on this on the last few hours, this MochaSoft app does everything it's advertised to do. I'd give it 5 stars if it didn't put me back at the login screen each time I went to the home screen or to other apps. For those of you who are trashing this app even though they have no idea what it is or what it's functionality is, why? This app is great for a niche market of iSeries users who want to access the system remotely. If you don't use it or know what it is, save your keyboard strokes and don't review it. This seems like a common problem in the App Store. Why doesn't Apple prevent users from reviewing apps they haven't actually downloaded? This app does everything it says. I seamlessly connected in a matter of seconds. It is well thought out and easy to navigate within.